The original edition of Exploding Kittens is family, kid, and workplace friendly! That one come is the RED box!!! The NSFW edition is not!!! I repeat if your buying this game for a family with kids to play don’t buy the NSFW edition!! It is very explicit. This game is a light fun party game. Even those who don’t play games will enjoy the simplicity, yet fun of Exploding Kittens. When it is your turn you choose to play a card on the discard pile and take that action or not too. You don’t have to always play cards. Though you can play as may cards as you would like per turn. You do have to pick up card unless during special circumstances due to action cards. You stay alive as long as you don’t draw an Exploding Kitten. If you do and have no action cards to stop it you EXPLODE and your out out of the game. THE LAST PERSON ALIVE WINS! Defuse Card = You can play this card to stop an Exploding Kitten. You get to stay alive! Place the Exploding Kitten in the deck anywhere of your choice. Nope Card = Stop any actions… except an Exploding Kitten. You can nope a nope cards as many times as you would like. You can play a nope card at any time of the game, it doesn’t need to be your turn. 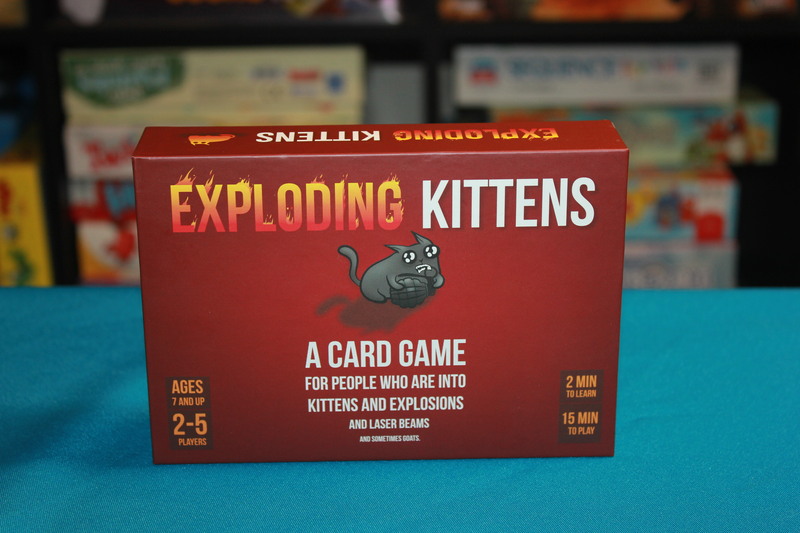 Exploding Kitten = You must play this card immediately the only way to stop it is with a defuse card. If you die discard all of your cards. Including the Exploding Kitten. Skip = End your turn without drawing a card. Skips can be used as a defused card 1 skip cards only skips 1 turn. Favor = Force any player to give you 1 card from their card. They choose which card to give you. See The Future = Get to personally see the top 3 cards of the discard pile. Three Of A Kind = Play 3 matching kittens to steal a “named” card from another player. If that player doesn’t have the card you named you get nothing. Materials: 5 Stars, This game is very well made. Recommend it to others: Yes, It’s a nice light party styled card game. Anyone can play & enjoy!